Visitors to this year’s Ormskirk MotorFest will be able to meet a current class leader in the British Rally Championships Challenge series at this year’s Ormskirk MotorFest. The free motoring extravaganza is a great day out for the whole family and returns to the streets of Ormskirk on Sunday 25 August. More than 10,000 people are expected to come and enjoy the fantastic displays at the event. Gary Wright, from Burscough, is the leading driver in Class RC2 of the NGK Spark Plugs British Rally Championships Challenge. He may well have been even further ahead but for his MGZR s1400 suffering an oil leak during the RSAC Scottish Rally. He will be bringing his car to Ormskirk for the MotorFest and will be one of the vehicles taking part in the parade laps around the town which always thrill the huge crowds. The Ormskirk MotorFest is organised by Aintree Circuit Club and supported by West Lancashire Borough Council. The countdown to this year’s Ormskirk MotorFest began in earnest last week with two exciting events which also marked National Motorsport Week. A fabulous fleet of vehicles lined up by Ormskirk Market on Thursday 4 July to celebrate National Motorsport Week and publicise the MotorFest. The display featured a 1970 Gilbern Invader, a 2005 Alfa Romeo GTV Cup, a 1967 Kawasaki Classic motocycle, a 2008 Ultima GTR, a 1997 Morgan 4/4, a 1981 Mercedes 280SL, a 1959 Messerschmitt “Bubble Car”, a 2008 MG ZR 190 Trophy race car and a GXR 1100 turbo motorcycle. All these will be on show at the MotorFest. Then on Sunday 7 July keen drivers tested their skills and reflexes on a specially designed course at the Ormskirk MotorFest Autosolo Car Challenge on the Park Pool Car Park. 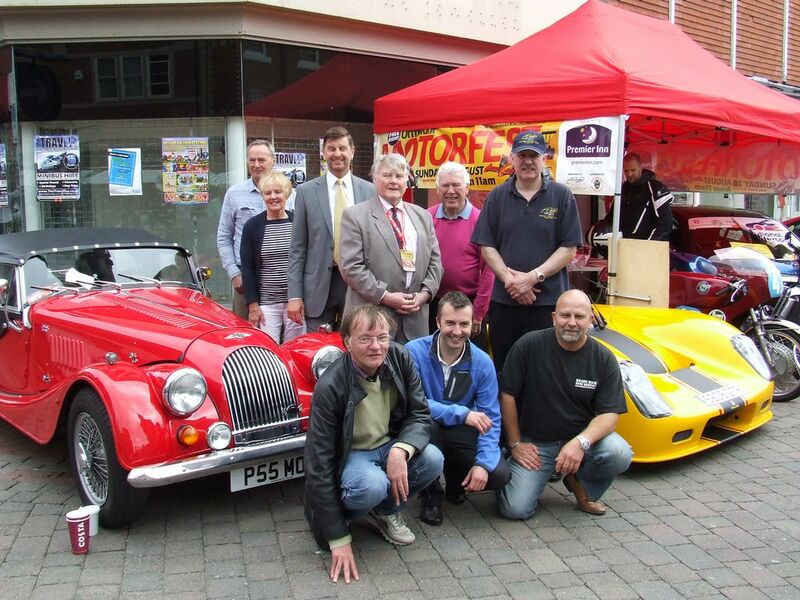 At the MotorFest a fantastic range of about 300 cars and motorcycles will be on static displays around the town centre, including on Aughton Street, Moor Street and in Coronation Park. There will be vehicles from all eras of motoring and many will take part in the parade laps. Other attractions on the day include a Vintage and Handmade Fair in the town centre.